"MOM, I’M RUNNING AWAY” - A CELEB’S CHILDHOOD GLOOM EVOKES..
A letter written to his mother. 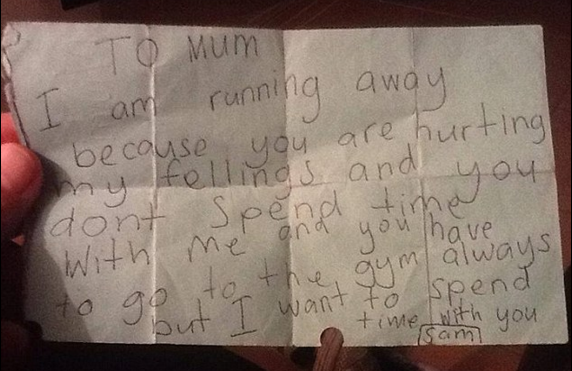 A child who is being less affectionate, writes to mum, that he decides to run away. His hurt feelings, seduce him take the tough decision of leaving home. “Running away” quoted, highlights that he is so anxious about the loneliness he felt without being around his mother, of his mother’s busy schedules and other prominence those that second his desires. So he notes his idea into a crumpled paper in big letters to say he is leaving home. This little boy, who is now a well-known character by his name Fortafy plays an entertaining role in the world of stars. His tragic incident about mom’s less care and her priorities for gym rehearsals made him pen his pain to a paper. His runaway written in his small day’s handwriting almost left a topic to talk about in the media throughout. Little hearts are yearning for love, affection and attention. They have small angle of viewing people around them. The only reason they adore; the images which care about them. The heavenly person on earth who could give them everything they need is “mother”. Mother is the person to whom a child runs for care, warmth and hunger. When they lose their needs they tempt to take hazardous choices. Make sure little ones are never left alone. Mom’s please go home. If You Think This Is Hilarious Please SHARE this with your friends and family..